Baritone and one of the most important concert singers of the nineteenth century. He was the son of a harpist (his father) and a singer (his mother) and was educated in Paris and Mannheim, where he enjoyed his first successes. In 1857 he joined the Opéra-Comique in Paris. In 1862 he was appointed conductor of the Hamburg singing academy, a post for which the composer Brahms was also a candidate. Brahms - who had been a friend of Stockhausen's since they met at the Niederrheinische Musikfest in 1855 - was furious, went to Vienna and never returned to his native Hamburg. In later years Stockhausen held positions in Berlin and in Frankfurt am Main. Stockhausen's tomb was created by the sculptor Hermann Obrist from Munich. 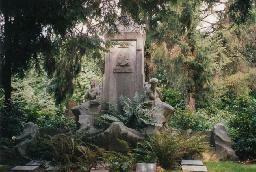 The grave of Julius Stockhausen at the Ohlsdorfer Friedhof, Hamburg.